Spirit Sand Dreaming, york gum root burl, 152mm high x 203mm dia. 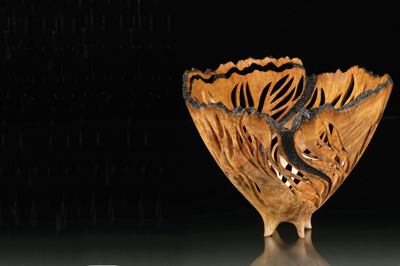 Spirits in Time, jarrah, 100mm high x 380mm dia. Spirit Dreaming, york gum stump, 150mm high x 190mm dia. Neil Turner has lived and worked on a wheat and sheep property 200km east of Perth in Western Australia for the last 50 years. "I always enjoyed the activity of farming; the nature of the work was different and varied. It was often a mix of long hours and hard work,â€ he tells me. And so when he finished his schooling aged 17 he returned home to become a third generation farmer. He worked alongside his father and brother until 2000 when he and his wife decided to divide the property and work their own land. Neil's son did not wish to follow in his father's farming footsteps, so the farm was sold, and they moved to a 10 acre bush block in the south west of Western Australia near Bunbury. 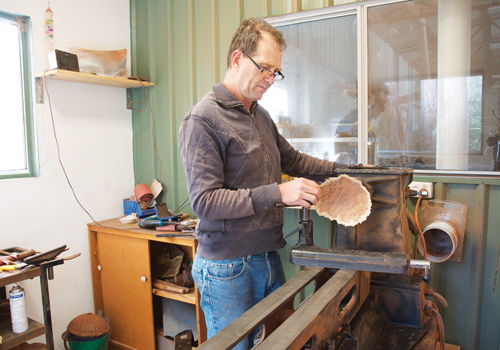 Attending the Australian School of Wood in Dwellingup was a lifelong dreamfor Neil: "I'd always been interested in furniture making and how I could translate carving and embellishing from my woodturning into furniture," he comments. With no more ties to the farm, Neil attended the school in 2010/11, learning new skills about furniture making, designing functional art furniture as well as carving and embellishment, and the rest is history! Neil had a rather obscure entry into woodturning; a friend of the family wanted a wooden lamp stand, and so at the age of 19 Neil made his first wood lathe. With a beginner's set of tools he turned what, looking back, was, according to Neil, "the most awful lamp stand" But the interest was there to be honed. Neil started turning stumps dug up by the plough and other wood he found on the farm. His lathe didn't provide the range of speeds required to turn large, out of balance stumps, and eventually he made another lathe, this time with a three-speed gearbox and two-step pulleys to increase the selection of speeds. This enabled him to turn stumps and burls without the lathe hopping out of the shed! As time went by this lathe with its whirring gearbox and other idiosyncrasies became outdated. After some investigation and viewing of manufactured lathes Neil acquired an Omega Stubby lathe, which has proved to be a good choice: "It provides all the items I require in a lathe - well made, Morse tapers in headstock and tailstock, large swing, up to 500mm extendable bed and an infinite range of speeds," he says. Neil describes himself as, "not a very technical turner... for me, how I arrive at the finished item is irrelevant as long as it's what I set out to achieve." He uses a 20mm bowl gouge for most bowl turning, and if scraping or shear scraping will get the job done, then that's what he'll do! 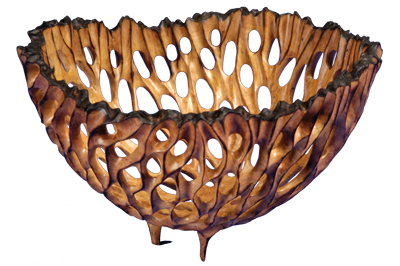 His main production pieces are natural edge bowls from burls and stumps, occasionally with some subtle embellishment. Furthermore, artistic sculptural pieces inspired by Neil's environment using fire, wind and to a lesser extent water are now something of a signature style. The farm environment heavily inspired Neil's early sculptural work, which started to evolve when he attended a workshop with Stephen Hughes in 1992 in Bunbury, Western Australia. 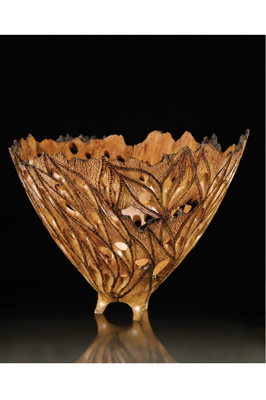 Neil attended two more workshops in the next two years with Stephen Hughes and Vic Woods, which opened his eyes to the limitless potential to carve and embellish on lathe turned pieces, and changed his turning direction. He started to experiment with carving on various forms: "They were a little crude at first," and most turners would say the same, "but over time the balance and proportion started to improve," he finishes. Interpretations of fire form and ripples in the sand made by the wind started to decorate his pieces and with more practice, the better the pieces became. Since moving to a new property he is close to the ocean and this has provided another source of material to incorporate into his work, with elements from the ocean starting to appear in his work. "I think my designs and finished products place me in a unique position, and in that I have a style that is my own" he says. Of course all turners are influenced by others too, and Neil is no exception. His greatest influences in his early years were David Ellsworth, Gordon Ward and Jack de Vos, who he describes as "masters of making their forms sing." Today, the internet has opened the way to look at so many other artists' work and Neil admits they've given him a few 'I wish I'd thought of that' moments! Neil also very much admires the work of Alain Mailland, Binh Pho, J Paul Fennel, Jacques Vesery, Betty Scarpino, Vaughn Richmond and Grant Vaughn - he stops there, but adds, "the list could be endless"
Neil has his Omega Stubby lathe set in a small space of 3m x 2.5m in an effort to contain the shavings and dust. He has two large windows, one behind and one to the right, which aids in airflow to minimise the dust - along with his large dust extractor - and to provide natural light. 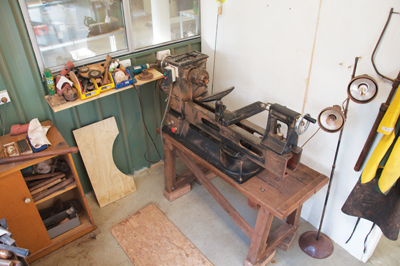 He has a bench grinder in one corner for quick sharpening, and all the other necessaries are stowed in or on a couple of bench type cupboards. A separate space next door for carving and embellishing is in a larger room with an old recliner rocking chair serving as his carving chair. "I find it more comfortable to be sitting in a reclining position when carving, as I'm not hunched over," he tells me. Good lighting is a must for fine detail when carving with small burrs. As well as his treasured Omega, Neil couldn't do without his Osada 40 micro motor carver: "It's an absolute joy to use; there is no vibration, no noise, it's light and fits well in the hand. Worth every cent." He affirms, and notes he also would be lost without his 20mm bowl gouge. The workshop is 30m from the house, so spending time in the workshop is not an issue. Neil usually starts at around 7.30am and depending on the project and the deadline, he's not often out of the workshop before 6pm, six days a week. 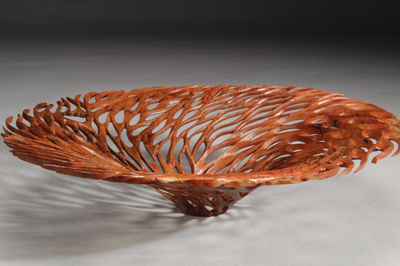 The time taken on work tends to vary depending on what's being made; 10 natural edge bowls will take him a day, whereas most of the sculptural and embellished pieces take from one to two weeks, depending on the detail involved. Enjoyment is of course key, and Neil enjoys all aspects of turning from sourcing material to designing and making each piece. Although, there is one part of the process which he would gladly delegate: "If my wife would sand and finish it would be the perfect pastime!" The real thrill for Neil is when someone admires one of his creations enough to purchase and display it in their home. "I've never really had any low pointsâ€ Neil says happily, "only in the early days not being able to spend enough time in the workshop." Thankfully though, the high points have been many, and the ones that come to mind when asked the question include having a photo included in the book 500 Bowls; winning Best of Show at the Australian Woodturning Exhibition; receiving an early morning phone call from the del Mano Gallery asking for some work to be included in their gallery and being asked to participate in the worldwide collaboration with Harvey Fein. "œI would like to travel and share my skills. The people I have learnt from have proffered their techniques freely - it is only fair that I do the same." Now that he can devote all of his time to turning, he would like to expand the number of galleries he supplies to. "Apart from that I haven't set a lot of goals at the minute, I will see how this new venture pans out for a while." One of Neil's aims is to attend the International Turning Exchange, a long time dream that will come to fruition next year. "I like to just keep practising my skills to become better at what I do. After years on the farm with my life very cyclical and structured I've decided to let life surprise me.â€ And we wish Neil many pleasant surprises in the future.